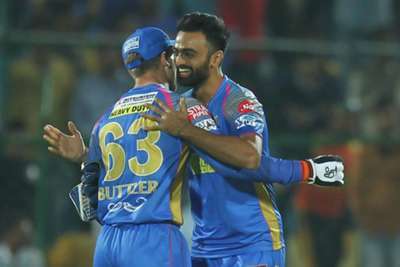 Jaydev Unadkat and Varun Chakravarthy were the big earners at the IPL auction on Tuesday as they went for around $1.2million each. The auction for the 2019 season saw two Indian players fetch the biggest fees, with Rajasthan Royals paying INR 8.4 crore for Unadkat as Kings XI Punjab matched that offer for Varun. Unadkat returns to the Royals, who stumped up INR 11.5 crore last year, while the sizeable offer for Varun - 42 times his starting price - raised eyebrows. Mystery spinner Varun, 27, remains uncapped at international level and made his name at the Tamil Nadu Premier League this year, where he led Siechem Madurai Panthers to their first title. Kings XI also picked up Sam Curran, paying INR 7.2 crore ($1m) for the England international, who had been one of nine players with the highest reserve price of INR 2 crore. Colin Ingram was also among that group and he returns to the IPL with the renamed Delhi Capitals for INR 6.4 crore. Ishant Sharma also went to the Capitals, while Jonny Bairstow was bought by Sunrisers Hyderabad. Mohammad Shami was another notable Kings XI signing. Several big names went unsold, however, including Chris Woakes, Cheteshwar Pujara, Hashim Amla, Shaun Marsh and Jason Holder.